A regular meditation practice brings with it many benefits, such as increased brain density, a boost in connections between neurons, decreased symptoms of depression and anxiety, improved clarity of thought, and an increase in endorphins that affect mood. Surprisingly to many, the advantages of meditation extend beyond the brain, and published studies have shown it can improve physical functioning and vitality, decrease chronic disease risks, and enhance overall quality of life. Similar to physical exercise, there are different methods that you can try as you build up your meditation practice and find a style that best fits you. 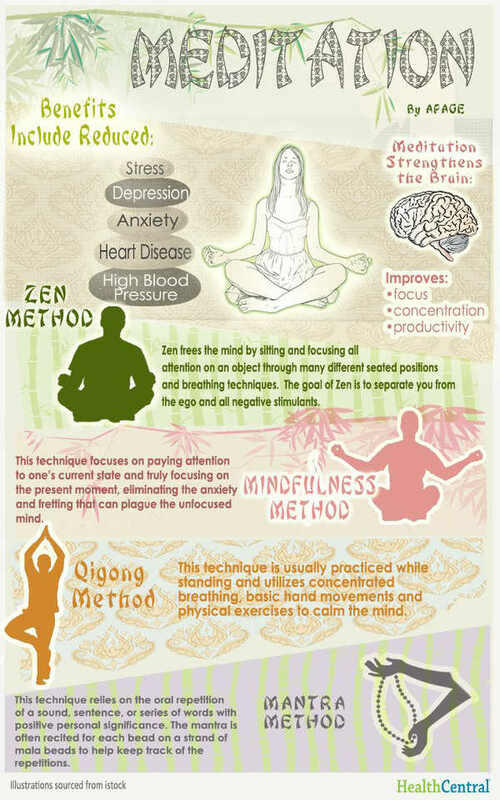 Below is an image that explains four types of meditation that you can consider. Some, such as the qigong method, may require additional resources such as a good guided meditation audio track, for example Qi Gong: Moving Meditation with Lee Holden, or a simple instructional book, for example Yang Jwing-Ming’s Qigong Meditation. But for many of us, finding a quiet space where we can close the eyes, practice some breathing exercises, or repeat a mantra in our head, is an ideal place to start. As you become more practiced at meditation, you will likely notice significant improvements in your energy, health and mental/emotional balance. Enjoy! This article was republished from themindunleashed.com.